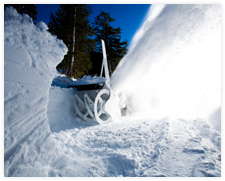 Kodiak America is a custom manufacturer of snow removal equipment. Kodiak machines are built featuring cutting edge, industry leading, new components while providing versatility to meet your demands. Our Product line includes snow blowers, runway sweepers, push plows and railway blowers. Through many years of experience with this type of equipment, Kodiak has developed a manufacturing philosophy designed to make the operation and maintenance of their equipment as durable and trouble-free as possible. Kodiak has manufactured equipment for overseas customers and most of the 50 States: including State & Government Agencies, Highway Departments, Airports, Ski Resorts, oil fields and private industry. We work with our customers to determine what piece of equipment best fits their application. All Kodiak machines are built using the latest state-of-the-art components. We work with our customers to determine what piece of equipment best fits their application. Our parts manuals include all of the OEM manufacturers of components so customers can buy many required parts from their local suppliers. Kodiak is a company operated by people who combined have well over 30 years of experience in the manufacture of quality snow removal equipment. Kodiak just builds the biggest, toughest snow removal in the industry. Nothing Can Stand Up To A Kodiak!